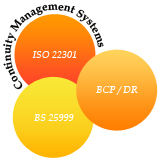 Certification of an organization’s Business Continuity Management System (BCMS) against ISO 22301 is one means of providing assurance that the certified organization has implemented a system for business continuity in line with the standard. Credibility is the key advantage of being certified by a respected, independent and competent third party. The assurance it provides gives confidence to management, business partners, customers and auditors that the organization is serious about business continuity management. The ISO standard, ISO 22301, "Societal Security - Preparedness and Continuity Management Systems - Requirements", specifies requirements for setting up and managing an effective Business Continuity Management System (BCMS). This effectively replaces the BS 25999, an independent standard for Business Continuity Management System (BCMS) released earlier by the British Standards Institute. Part 1 is the Standard Code of Practice which establishes the principles, terminology and process of business continuity management. It covers the activities and deliverables applicable in establishing a business continuity management process for organizations of all types, sizes, and missions whether governmental or private, profit or non-profit, large or small, or industry sector. Part 2 is the Management Standard Specification which outlines the requirements for implementing, operating and improving a documented BCMS that can be objectively and independently audited. Business Continuity Management (BCM) is a management process that identifies potential impacts that threaten an organization and provides a framework for building resilience and the capability for an effective response which safeguards the interests of its key stake holders, reputation and brand. Business have evolved over a period of time and such reliance are built by enterprises ad-hoc, based on short term needs and are on stand-alone basis. Developing a comprehensive and integrated Business Continuity Management System (BCMS) is a challenge faced by most enterprises. Business Security becomes an important component of the business and provides confidence to the entire business ecosystem. Eventualities become manageable issues, responses predictable and business deliveries balanced. This workshop aims to provide an approach to developing a comprehensive Business Continuity Management System (BCMS) by adopting global best practices and standards. This workshop enables organization to strengthen their management systems and capabilities to enhance organizational resilience. This workshop will help participants understand how to implement / audit the requirements of ISO 22301 for the organization. Anyone aspiring to understand the requirements for certification of an organization’s Business Continuity Management System (BCMS) against ISO 22301 would benefit from this workshop. Those who are working or have worked in Business Continuity Management will find this particularly useful. Prior knowledge on BCP/DR and the BS 25999 standard is desirable.